So since I’ve been giving this day-by-day account of how many pages I’ve turned in Bjarni Harðarson’s satire about Iceland’s financial crash Sigurðar saga fóts, and indeed have in consequence made this blog one of the top hits for Google searches on the book, I feel I ought to actually write something about it! This is basically the blogpost-of-the-lecture, and the lecture itself will in due course go up here. And I’ve actually written such a vast post I’m almost certain no-one will read it, but there, I wanted to get these ideas down before teaching starts and they all evaporate. Having put all this work in reading this damn novel, I now ought to see about writing an article about it sometime, and I figure a blogpost would be a good first step. Of course, if you do find yourself grinding your way through any of this post, I’d well appreciate any views you want to express on it, especially as I (a) have probably made some mistakes; and (b) know very little either about modern Icelandic literature or about the financial crisis! Why should we care about financial crisis novels from Iceland? It wasn’t self-evident to me that indeed we should care about this stuff when I started thinking about it. I think the relevance of Iceland to the world is quite easy to argue: Iceland’s a case-study in how the world financial crisis happened. Getting a grip on the Icelandic story is a way to get a grip on the whole big mess. Moreover, and perhaps more importantly, Icelanders may have a better chance than any of us of reshaping their state, democracy and economy in creative and inspiring ways. It’s a such a tiny place: democracy has a chance of working differently there; changes can happen quicker; it has especial potential for sustainable energy and so a sustainable economy. A pointer to the place’s potential is the crisis-inspired Icelandic Modern Media Initiative, aiming to make Iceland an international haven for freedom of speech and transparency of business and governance. Whether you see this Wikileaks-inspired development as another Icelandic example of things-not-to-do, or as a step towards a juster world order, it’s worth keeping an eye on. But why art? There have after all been lots of documentaries about the financial crisis—both Iceland’s and, as was emphasised to me by Portuguese Documentary Guy back on Day 15, other people’s—and hopefully there will be a lot more. There’s also been a slew of autobiographies by Icelandic bankers; government reports; and so on. (And I’ve hardly begun to look at all these; I saw Future of Hope but it was, alas, as twee as the title suggests.) Maybe it’s too early for novellists, musicians and movie-makers to weigh in? But working on Bjarni’s novel made me realise that actually art is potentially a really important way to engage people in what are potentially hopelessly abstruse debates about bank regulation; the nature of the economy; and the relationship between states, governments, citizens and business. I don’t want to see a good crisis wasted, and as the Eurozone crisis hurtles on, there’s clearly plenty more of it for us to not waste. Somehow, we all need to be able to develop a stance on how the world should look after the second Great Depression, and push for it. Art can perhaps bring more of us into the debate. And art can perhaps bring different perspectives into play too: it needn’t just be about making economics digestible. It can explore possible futures, and possible pasts, which are worth thinking about but which are inappropriate to documentaries or government reports. I suspect that there’s still a bit of a dearth of material at this level, but below I’ll try and suggest some interesting perspectives which Bjarni’s novel brings into view. But I hadn’t even noticed there was any financial crisis art! Yeah, nor had I clocked any outside Iceland till I started poking around—a lot of friends helped me out in response to a Facebook post. And some of their suggestions were very creative too, but so far, my trawl of art which directly and specifically responds to the financial crisis is still pretty thin: non-Icelandic leaders are David Hare’s commissioned play The Power of Yes (this and another couple discussed here); Justin Cartwright’s novel Other People’s Money (discussed with some others here); and a few songs (like Chris Wood’s ‘The Grand Correction‘ and—how could I forget?—Dizzee Rascal’s ‘Dirtee Cash‘). And of course some originally unconnected works took on a new meaning with the crash, most prominently Sarah Prebble’s musical Enron. All these are British, as probably are the majority of my friends; but David Cole’s little rant suggests that this isn’t entirely an accident of sampling (and cf. Dorian Lynskey on music). I’ve come across stuff in Iceland, however, without even looking. Obviously the crisis has been a bigger issue there than anywhere else so far, so that makes sense. But it must also reflect Iceland’s enormous per-capita cultural production (if you publish enough books, one is bound to be about the crash…) and the ability of this small art-for-art’s-sake market to respond quickly to external circumstances. Reykjavík’s city theatre, the Borgarleikhúsið, has been pretty active, most famously in holding a non-stop six-day reading of the 2,000-page government report on the crash. They subsequently performed Enron, as translated by Eiríkur Örn Norðdahl, as a commentary on the crisis: the trailer looks pretty cool: I’m sorry I missed it when I was in Iceland last year. Then, I’m in this bookshop, right, and pick up this kids’ book Bókasafn Ömmu Huldar (Granny Huld’s Library) thinking it’ll be good for learning Icelandic, and it’s about a dystopian future where banks abduct parents; and I’m in a record shop and I pick up the Samúel Jón Samúelsson Big Band’s Helvítis fokking funk (doesn’t really need translating) thinking I haven’t heard enough brass lately, and it’s a concept album about the crash. There’s Bjartmar og bergrisarnir’s Skrýtin veröld too. So I bumped into more financial crisistastic art just by hanging about in Iceland than by making a moderate effort to hunt it out on Britain. And if Iceland’s the place that’s producing this kind of stuff, maybe that’s where we need to look to consume it. In the story, Bjarnhéðinn kaupahéðinn is a two-bit alcoholic entrepreneur who by an ostensibly luck-of-the-drunk series of chances comes during the 1970s and 1980s to own a small business founded on a little chain of florists. (Though we get a hint of the secrets of his success early on, when we see a property deal between him and a friend: ‘allir voru í ábryrð fyrir alla’, ‘everything was standing as surety for everything else’, p. 36.) After a long period of unemployment, Sigurður fótur is brought into his dad’s business as a partner, whereupon he glances at the books and realises the whole thing is a total financial disaster—and is now as much on his plate as his father’s. So when he gets called in by the bank, he’s expecting the worst—but finds himself instead being convinced to take part in a bit of business chicanery (I have to admit that I’m hazy about the details of this at the moment) involving an inflated share-purchase by the Nord brothers (whoever they are: I’m sure it’s obvious if you’re an Icelander!). Sigurður and his dad find that they’re rich, and an all too predictable series of over-leveraged purchases follows, bringing them, amongst other things, the chairmanship of the Stóri Þjóðbankinn, which Bjarnhéðinn holds and, after Bjarnhéðinn’s death, Sigurður; and ultimately the Icelandic financial crash. Eighth on my list is the heritage of discovery and exploration, fostered by the medieval Viking sagas that have been told and retold to every Icelandic child. This is a tradition that gives honour to those who venture into unknown lands, who dare to journey to foreign fields, interpreting modern business ventures as an extension of the Viking spirit, applauding the successful entrepreneurs as heirs of this proud tradition. A comparison which in 2005 looked big and clever in 2008 looked hubristic at best, comic at worst. The handy thing about the medieval Sigurðar saga fóts for Bjarni is that it transposes the world of Viking activity described with stark and sober effectiveness in thirteenth-century sagas about Icelanders into a cartoonish, colourful setting inspired medieval European romance, prompting a reassessment of those suddenly incongruous Viking values. I’m really in two minds about whether the medieval Sigurðar saga fóts was intended as a parody of traditional martial, masculine values. It’s a very short, rather disjointed text, where characterisation and motivation are mostly pretty sketchy. The significance of a singularly prosaic prophetic dream proves beyond the grasp of Sigurður, giving rise to a plodding exposition by the dreamer. One way to rescue the saga from being seen as just a lame text is to argue that it’s a parody: that all this baldness is part of the joke; that Sigurður is being ruthlessly presented as an idiot. But if it was a parody I’d hope for more of a display of, well, wit. 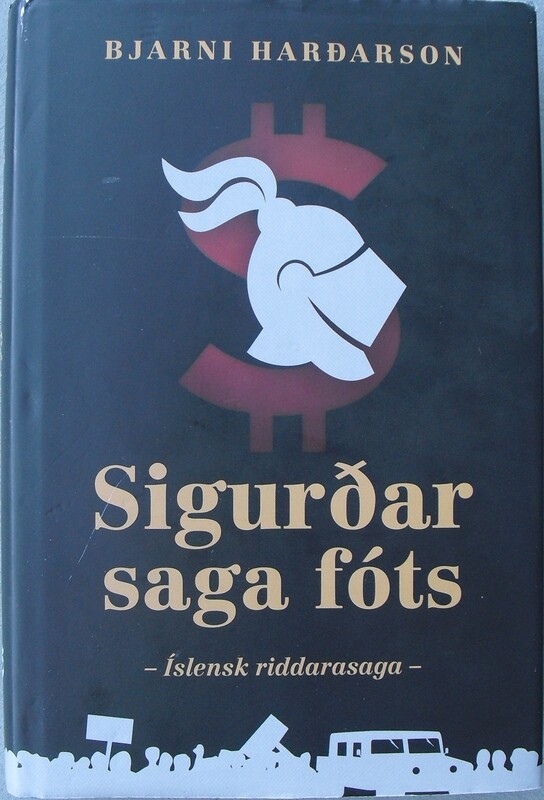 The saga lacks the dry wit, control of suspense, or deftness of characterisation and motivation of one of the seminal Icelandic romance-sagas, Hrólfs saga Gautrekssonar (available in translation by Hermann Pálsson); it lacks the verve of Jarlmanns saga og Hermanns or even the looser but enthusiastic Sigurgarðs saga frækna (both of which I’m currently involved in translating). 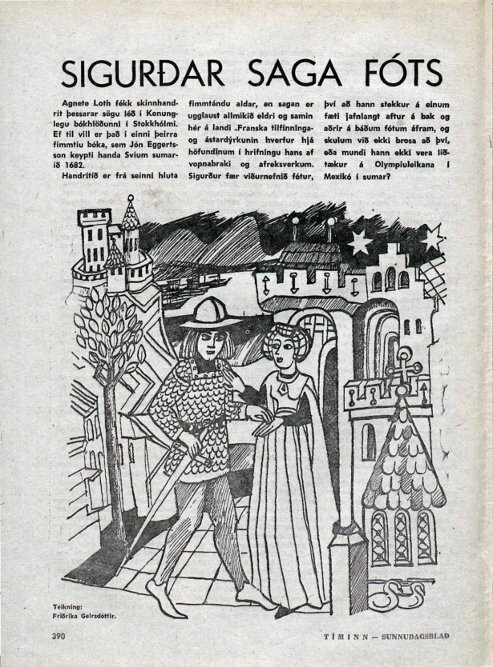 When the saga was reprinted in 1968 for a general audience in the Sunday paper Sunnudagsblað, it was presented as light-hearted entertainment, set off by the quip that Sigurður fótur would perhaps make a good addition to the Icelandic team at the 1968 Mexico Olympics and a rather nice illustration which focuses emphatically on monogamous affection. Maybe it’s a satire that’s just too straight-faced for me to twig; but maybe it really is just an over-compressed, going-through-the-motions action movie type text. ‘Sigurðar saga fóts’, Tíminn, Sunnudagsblað (26 May 1968), 390–393, 406, accessed from <http://timarit.is&gt;. But either way, it works for Bjarni to play off the saga. The saga’s plot is—as usual in medieval romance—about unmarried aristocratic men trying to get themselves suitable wives, who are, however, treated by their men more or less as chattels; in fact Sigurðar saga fóts is one of the bluntest stories of this kind in medieval Iceland. Indeed, if I remember Daniel Sävborg’s Sagan om kärleken: Erotik, känslor och berättarkonst i norrön litteratur right, it’s only saga in the genre where the girl actually explicitly expresses her ‘love’ (ást) for her intended husband, a gentleman by name of Ásmundur King of the Huns—but Ásmundur nonetheless hands her over to her other wooer, Sigurður fótur, in what appears to be a gesture of blokeish solidarity. Bjarni’s novel opens with a quotation from the saga in which Sigurður announces he will fight anyone for his intended bride, and he nods to this plot element in his own story: Sigurður and his best friend Ásmundur Jamil Neró (his odd name is explianed by him being half-Palestinian) compete for the same girl, and Jamil goes to prison for Sigurður when Sigurður gets busted for some low-key drugs trading in his youth, but they stay mates.*. The marginality of wives, girlfriends and children to much of the lives of the male protagonists in Bjarni’s novel recalls the saga and is no doubt in itself a comment on the oft-discussed lack of any female presence in the business culture of the Icelandic bubble. Insofar as there are voices of reason in the novel, they are women’s. But Bjarni’s point seems to be a more general one: that these útrásarvíkingar are fundamentally selfish in their quests for personal gain. Like other Icelandic romance heroes, Sigurður fótur cuts swathes through undifferentiated cannon-fodder in battle; it’s almost a requirement of the bombastic Icelandic romance genre that whole armies perish on the altar of the bridal quest. At the end of the medieval Sigurðar saga, Ásmundur has travelled to Ireland to win Elína, the daughter of the King of Ireland, as his bride. But the king has instead offered Ásmundur battle, won, and imprisoned him. Prompted by the aforementioned prosaic prophetic dream and associated advice of his wife Signý, Sigurður fótur sails off to rescue his friend, and defeats the Irish king. Þarf eigi hér langt um að hafa, að það verður ráðum ráðið, að Ásmundur fær Elínu, og er þegar að brullaupi snúið. Og að veizlunni afliðinni sigldu konungarnir burt, Sigurður og Ásmundur. Leysti Hrólfur konungur út mund dóttur sinnar sæmilega í gulli og dýrgripum. Skildu þeir nú með vináttu. It’s not necessary to make a long tale of this: it was decided that Ásmundr would marry Elína, and the wedding was immediately prepared … King Hrólfr paid his own daughter’s bride-price in a noble fashion, with gold and precious things. They parted now with friendship. — Ekki orð, svaraði Kex á sinni hörðu norðurþýsku. Þið haldið að við eigum ekki neitt, séum ekki neitt og getum ekki neitt. En ég skal segja þér hvað við höfum, vinur. Við höfum blómin í Afganistan og ekki orð, ekki orð. Finally, here’s something Sigurður understands: a real product, for a hungry and proven market. He snaps up the deal. At one level, we should surely read this as part of Sigurður’s descent into villainy—an example of his immoral desire to expand his riches just like the racketeering heroes of the medieval Sigurðar saga, who care about the wellbeing of neither the women they pass between them nor the peasants they scythe through to win them. Bjarni offers the drugs trade—the bête noir of Western society—as a counterpoint to the short-selling, mis-selling, derivatives and other chicanery at the top of the financial system, which have proved equally immoral and destructive but have not, as yet, produced much by way of prosecutions or even solutions. Nor is this episode—or even the subsequent lurid murder of Sigurður’s Icelandic contact in Turkmenistan, which results in his arrival back at the Icelandic office in the form of seventy kilos of dogfood, a wallet, and a haldful of fillings—entirely unparalleled in real life: it was the Baltic drinks company’s operation in Russia which somewhat startlingly secured the fortunes of Björgólfur Guðmundsson and Björgólfur Thor Björgólfsson. Working in the beverage industry in Russia is, I’m told, already circumstantial evidence of involvement with the mafia; and it does appear that the Björgólfar indeed lost a director to assassination. (The most respectable source I have for this is this Guardian article, but I must see if any of my Russian friends will help me follow this up in Russian-language papers.) Writing satire allows Bjarni to explore this perfectly plausible criminal dimension of the Icelandic financial crisis in ways which government reports and autobiographies cannot. So Bjarni is able to use the medieval Sigurðar saga fóts as a reference point when satirising the acquisitive activities of the útrásarvíkingar. To take this a bit further—developing a point made to me after the lecture I gave—reconceptualising the útrásarvíkingur through the wacky world of romance also challenges the myth of Icelandic national solidarity which medieval texts about Iceland’s medieval settlers have traditioanlly been used to construct. Bjarni’s novel emphasises how, when the Icelandic banking sector is privatised, power-brokers and strident vox pops insist that these Icelandic assets shouldn’t fall into foreign hands—batting aside a bid by the Kaupfélagsstrákarnir (‘Co-op boys’) to bring in some ‘erlendan banka’ (‘foreign bank’, p. 144). People insist that the banks should be handed to strákarnir okkar (‘our boys’—a phrase not used in Iceland of the army, because they don’t have one, but of the next best thing: the Icelandic football team). Þorvaldur Gylfason, in his 2009 Beck lecture, points out what a disaster that was, contrasting Iceland with Estonia, which when the Soviet Union fell recognised the lack of local expertise in banking and let foreign banks take the sector on—and of course Estonia is doing better at the moment economically than anywhere else in the EU. Rather than seeing the state and state institutions as the mechanism for Iceland’s collective wellbeing, people in Iceland, Bjarni tells us, had the idea that privatised banks would still be working for the common good of Icelandic citizens as long as they were owned by Icelanders: fellow settlers; fellow representatives of the spirit of Icelandic independence—independence not so much from one another as from foreign rule. But Bjarni instead identifies these Icelandic financiers with fantastic foreign aristocrats, romping around Europe without a care for anyone else. Maybe Bjarni wishes to take apart the myth of Icelandic solidarity, suggesting that we’re all just individuals on the make; or maybe he wants to preserve that narrative, but banish these bankers from this Icelandic commonwealth. Either way, the idea that things can be privatised but still somehow remain the assets of a nation is destabilised. This reminds me too how easy it is for me as a medievalist to get caught up in Icelandic national narratives: these romance-sagas have traditionally been seen as foreign rubbish, and I spent a chunk of each of my Beck lectures arguing that we should see them instead as lively, interesting, dynamic engagements of the medieval Icelandic community with European culture. Which I’m sure is basically right, but it’s easy to assume, as I have, that the romances do somehow represent ‘the Icelandic community’—or at least, in the Middle Ages, the posh end of it. But maybe I should be thinking of medieval romances composed in Icelandic as narratives of individuals on the make rather than explorations of any kind of national identity. As I say, so far that’s covered with much less concision more or less the same ground as Jón Daníelsson. Beyond all this, though, what caught my eye was the prominent role of class in Bjarni’s book. I’m not sure how far this is inspired by Björgólfur Thor Björgölfsson himself—not at all as far as I’ve noticed, but I haven’t done much reading about him yet. In the Iceland I’m familiar with, discourses about class are commonplace. Iceland doesn’t look much like a Nordic welfare state—I mean, it has amazing healthcare and stuff, but my friends complain that political power has stayed in the hands of a small group of quasi-aristocratic families for, like, ever; and of course I know Iceland as a profoundly capitalist place. These complaints are already there in Halldór Laxness’s Nobel-prize winning Atómstöðin from 1947 (whose critiques of Icelandic politics and economy I find uncannily relevant to today); and they’re there, say, in the movie Mávahlátur, set about the same time but made in 2001 (adapted from a book which I haven’t seen). That said, conventional wisdom seems to have it that Icelanders in the second half of the twentieth century also wanted to think of their society as classless and egalitarian. So maybe Bjarni’s pushing a relatively new line here—I’m not sure. The medieval Sigurðar saga fóts blithely explains the epithet of its hero thus: ‘hann var svá snarr ok fóthvatr, at hann hljóp eigi seinna né lægra í lopt upp ok á bak aftr á ðrum fœti en hinir frœknustu menn á báðum fótum framlangt’—a slightly baffling statement which seems to mean something like ‘he was so quick and nimble-footed that he neither leapt up more slowly nor lower into the air, landing backwards on only one foot, than the most valiant people on both feet forwards’. The statement is a take-off of a similar but marginally more sober characteristic of Gunnar Hámundarson in the famous Njáls saga, and suspiciously has no subsequent relevance to the plot. (Again, plain duff writing, or slightly maladroit satire?) But the epithet in Bjarni’s novel takes on quite different proportions. As the old-fashioned Danish spelling suggests (the Icelandic spelling would be Þór), Björgólfur Thor Björgölfsson takes his middle name from his great-grandfather Thor Jensen (1863–1947), a Danish merchant and the richest man in Iceland of his time. Meanwhile, Sigurður fótur’s epithet is officially Sigurður Frits: his great-grandfather is Langa-Fritz, a great herring-merchant whose descendants, the Fiddarnir, ‘voru komnir af frönskum konsúl, næstum eins fínir of Thorsararnir’ (‘were descended from a French consul, almost as noble as the Thor Jensen’s descendants’, p. 11). So far, this makes Sigurður a straightforward parody of Björgólfur. Hvaða vitleysa, þú hefur aldrei heitið Frits. Ekki hér í þessari smiðju. Þú heitir bara Sigurður F., já eff eins og í … í fótur. Þú ert líka svo fótstór og varst strax fótstór. […] Já og veistu hverjir voru þeir fótstóru í þessu landi til forna? […] Það voru þrælarnir sem voru fótstórir af öllu mýralabbinu og þeir voru líka einu heiðarlegu mennirnir sem hingað komu. Hitt voru bara þrjótar og illmenni. What rubbish, you’ve never been called Frits. Not here in this smithy. You’re just called Sigurður F., yeah, f as in … as in foot. Your feet are so big, and grew big from the day you were born. […] Yeah, and do you know who had big feet in this country in the olden days? […] It was slaves who had big feet, because of all that walking in the marshes, and they were also the only honest men who came here. The rest were just villains and scoundrels. So Sigurður fótur grows up a blacksmith’s grandson, the heir to the honest slaves, the unsung heroes of Iceland’s settlement. Faced with inheriting the financial disaster of his father’s business ventures, he finds comfort driving the forklift truck on the shop floor, moving stock about: it feels like he’s at least getting something done. Even as his business successes grow, he goes to meetings in a leather jacket and jeans. But as Sigurður fótur grows richer, and is enthusiastically accepted by the Fiddarnir as one of their own, the image of Sigurður Frits is increasingly thrust upon him, as media commentators and advisors both take control of his outer image, and hollow out his self-image. The work Sigurður does likewise loses all meaning, and he often finds himself wishing for the old fashioned capitalism which involves actual stuff. As he says to his mother near the end of the novel: ‘það eru ekki peningar sem við ráðum yfir […] það eru peningarnir sem ráða yfir okkur, mamma mín’ (‘it’s not money which we control […] it’s the money that controls us, mum’, p. 218). there is something a little suspect about how good these plays make us feel. Money and Enron are both fantastic shows, spectacular and chilling. Booing at their pantomime-villain bankers and traders feels great, but that’s mainly because they allow us to point fingers and condemn the bad guys in a way that we singularly failed to do at the time. Although there were a few perfunctory attempts in each show to remind us that we, the great public, are the ones who facilitated the high-level deceptions – with our failure to question unsustainable returns and our willing collusion in a too-good-to-be-true system as long as it gave us three bedrooms and an en-suite – none of them really hit home. Instead, we got to revel in our own humility and restraint compared to the mad maths geniuses whose hubris dragged us all down. As Flatt points out, that’s fine as far as it goes, but it doesn’t get the rest of us closer to fixing the mess. Both in the sense that it doesn’t apportion all the blame corretly, but also that it leaves us with the sense that we can’t do anything about it: if we had nothing to do with it all in the first place, then how can we take a stake in it now? What the novel Sigurðar saga fóts does is take us into the world of a banker and, in my experience of the novel, force us to sympathise with him—even if we’re also laughing at him. The idea that Iceland’s boom was all just a dream—a time of happy make-believe—has been quite widespread in Icelandic discourse on the subject. Bjarni uses this idea right through the novel, right from what sounds like a prophetic dream by the four-year-old Sigurður fótur in which he’s attacked by an ugly red bird (no, I don’t know what it represents… But maybe I’m being as dim as his namesake in the medieval saga)—but for Sigurður, he’s in a nightmare, not a dream: a meaningless world where he finds himself participating in illogical processes but can’t seem to get away. When Sigurður sees and seizes the chance to balance his already crazy debts with some ‘flowers in Afghanistan’, I can’t help sympathising, and—for all that I disapprove of wrecking lives through the heroin trade—I wonder how upstanding I’d be in the same circumstances (cf. this recent BBC report). In turn, towards the end of the novel, fundamentally trapped by the fact that at the bottom of the whole pile of financial chicanery is some real debt to some real Russian drugs-barons, Sigurður’s insistence on participating in the madness, to the extent that he becomes part of the mechanism which forces other people to stay in the game, becomes easier to comprehend. — Djöfullinn að hann pabbi þinn skuli missa af þessu. Sá hefði skemmt sér. Bjarni invites us, even if through satire, into the bankers’ shoes; he invites us to mock them but also, I find, to pity them. Maybe he’s just aiming for the ity of contempt, but I find the pity of sympathy too—and the message therefore that the crazy financial system needed (or needs) to be undone for their own wellbeing. But Bjarni does more than that. Although they only appear round the edges, normal people—by which I non-politicians, non-bankers—and their entrapment by the system also appear. Sigurður’s mother can see the emptiness of her son’s work, and his unhappiness, and largely views Iceland’s bubble with contempt; but ultimately realises that she still can’t just detach herself from it. It was her idea for Sigurður to take a share in his father’s business, and she winds up being whisked off to Spain at the end of the novel. But the participation of normal people is really encapsulated when Sigurður finds himself shuffled into a marriage of convenience with Ella Nord, a relative of the Nord brothers who originally bought the shares in Bjarnhéðinn and Sigurður’s company. Sigurður is handsome, a self-made man but also an aristocrat, and as the voices of the media within the novel don’t hesitate to tell us, it’s the marriage of the century. Meanwhile, however, he’s recently started sleeping with an overweight and heavy-drinking cleaner from his workplace, Vala Maríudóttir. Not wanting to miss the marriage of the century, Vala gets Sigurður to let her attend by getting her onto the casual staff roster. Utanríkisráðherra hafði flutt hjartnæma ræðu þar sem hann líkti Sigurði fót við víkinga fornaldar, kallaði hann útrásarvíking hins nýja tíma. Næst á eftir ætlaði veislustjóri að gefa forstjóra eins olíufélaganna orðið en þá heyrðist slegið fruntalega í glas og við borðsenda brúðhjónanna stóð Vala Maríudóttir með svarta svuntu. — Kæru þið, kæri Sigurður og þið öll. Fyrir hönd, — segir maður ekki þannig? — jú, fyrir hönd eða önd okkar starfsfólksins, okkar hinna óbreyttu á gólfinu hjá köllunum okkar, Sigurði fót og Bjarnhéðni kaupahéðni, já okkur finnst þetta gegt og okkur stelpunum finnst hann Sigurður eiginlega miklu flottari en víkingur, okkur finnst hann vera riddari, hann er í raun og veru riddarinn okkar á hvíta hestinum og nú þegar hann er að gifta sig þá fmnst okkur eins og við séum allar að giftast honum og kannski erum við það bara, svo þú skalt passa þig, Ella mín, því við erum allar skotnar í honum og hann veit það. Hann Sigurður minn. The foreign minister had given a moving speech in which he likened Sigurður fótur to the ancient Vikings, calling him a modern-day Viking raider. Next, the master of ceremonies had planned to give the word to the CEO of one of the oil companies but then an impertinent tapping on a glass was heard, and at the end of the bridal couple’s table stood Vala Maríudóttir in her black apron. After a silence in which the M.C. wishes the floor would open and swallow him, rapturous applause breaks out. This is the key moment in Bjarni’s renarration of Sigurður from útrásarvíkingur to riddari viðskiptalífsins (‘knight of the business world’). For Vala, of course, part of the point of this speech is to express her claim to Sigurður (which in practice she sustains until some time after the crash and their espace from Iceland). (Is there scope for reading hönd og önd as being about marriage and love? I’ll have to check sometime.) But it also functions to make Sigurður an everyman: an example of working-class wish-fulfilment made good. Vala expresses how Icelandic society as a whole bought into the dream. And certainly writing from a British perspective, scant months after the most recent royal wedding, the scene is close to the bone. I’ve talked about the possibility that we should read the medieval Sigurðar saga fóts as a parody, but, though Vala, Bjarni emphasises how liable people are to swallow such texts whole, taking the wish-fulfilment without thinking through the violence which is their real stock in trade. I’m interested in this on the one hand because it respresents ways in which the medieval Sigurðar saga fóts went from being a text apparently by and for the elite of Icelandic society to, by the eighteenth and nineteenth centuries, circulating mainly among the poorest in Icelandic society. But I’m also interested in it because it makes us all a part of the financial crisis. The trick is to work out how that gives us all agency in doing something about it. That would start with not getting fooled again, and not getting fooled again would involve taking a hard look not just at the details of financial regulation, but what it is that might have made Sigurður fótur a happy man, and how we can structure our lives towards that, rather than some empty vision of knights of capitalism. If this was a proper article, I’d have to write some conclusions here. Maybe I even will come back and add some later. But for now, I’m just relieved that it’s a blog post, and I’m at liberty to stop when I want! Fortunately for you, you were at liberty to stop when you wanted too, so you probably didn’t get this far. But like I say, if you did, then comments are welcome! * Though I wonder if Ásmundur takes a kind of self-destructive revenge later in the novel by driving his friend ever further into financial peril; I’ve got to reread it to decide about that.